Though seemingly possessing disparate styles, Eminem and 50 Cent have managed to emerge as one of hip-hop’s battle-tested partnership. The pair reaped the benefits of a lucrative early-millennium run, while later shedding blood together in a heated melee with Murda Inc. 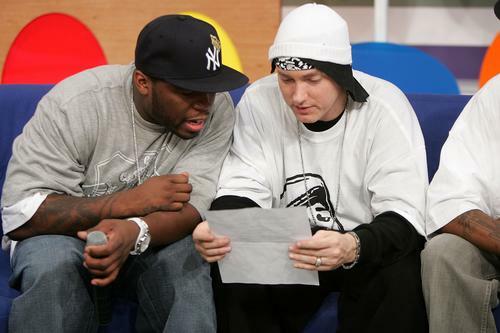 Though they’ve given us plenty of dope music throughout the years, unfortunately, 50 Cent and Eminem have not linked up in a minute; off top, it feels like the last time they shared the mic was in 2009, on Relapse single “Crack A Bottle,” as “My Life” was a somewhat forgettable moment in their repertoire. Now, however, with 50 eying somewhat of a musical comeback, it’s entirely possible that he’s looking to get the band back together. As it happens, 50 recently hit up Larry King Live for an in depth interview. As he tells it, the pair linked up overseas while Em was in London for his Revival tour. “There’s a few ideas I’ve been working on,” 50 reveals. “When I was working with Em in London, he said he had a few ideas that maybe we could work on together.” While such talks may very well be the fleeting aspirations of two long-since-reunited friends, it’s entirely possible that 50 remains steadfast in his efforts. We’ve long wondered what a 50 & Em collaboration would sound like today, and life is at its most fulfilling when curiosities are satiated. As for potential release dates, 50 keeps the answer logical. “”I don’t know, when we get a chance to record them.” Fair enough.